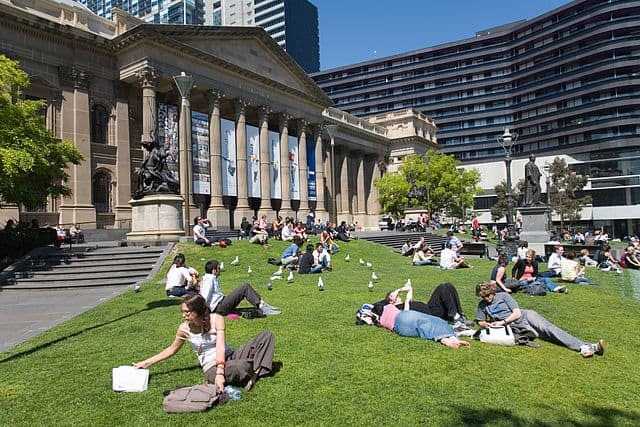 The grassy forecourt of the State Library of Victoria is a lively place where people gather to rest, eat, play and observe. At a recent writing workshop (which I will write more about in the days to come) we participants were asked to spend fifteen minutes observing someone, and writing about them. One woman wrote about two children playing chasing games. Several wrote about a pair of chess players. Another described a kiss in telling detail. No-one who knows me (my lovely husband least of all), will be surprised to learn that I focussed on a good-looking tradie. Here’s what I wrote in fifteen minutes, unabridged and unedited. Be kind. So handsome. So confident. Sleeveless shirt to show off his solid guns, his single sleeve of ink. A tall and fine young man with dark skin and a winning smile. His flouro vest gives him status and credibility – is he with the buskers or just an enthusiastic listener? The long-haired blonde girl beside him is less enthusiastic although he’s trying hard. He chats and weaves and grins but her legs are firmly crossed away from him and before too long she shakes his hand (she shakes his hand!) and walks away. He watches her go, on her long slim legs, and ruefully lights a cigarette. Was she resentful of his flirting, of his intrusion into her lunchtime space? Or, once safely back at her desk, will she spend the afternoon with a secret smile, flattered and charmed and electrically self-aware. She shakes his hand! I think he was selling something, Mary Kay? Ah memories of romance at the SLV… I got engaged (the first time) under a tree on that grassy forecourt. Oh! How perfectly romantic! Swoon. “electrically self-aware” what a vivid description of that experience, totally transports me to that feeling. Thanks Tathra – and welcome!